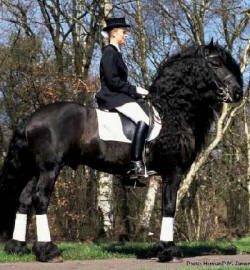 Marije Ant - Ster is a beautiful 16.3 hand Ster Friesian mare. She has flawless conformation, grace and power in her gaits, elegance and an air of majesty in her carriage. Her temperament is kind, gentle, sweet, intelligent, respectful, trusting and always looking to please. Marije has passed these qualities on to every foal she has produced. Anton 343 is currently rated #3 sire in the KFPS Breeding Index of all approved Friesian sires in the world for passing on the highest quality of gaits, conformation, and type. This is the highest rating of any KFPS approved Friesian stallion in North America. Peke 268 reached the “Honorary Class” for driving – very few Friesians ever reached this honor. Peke was known for passing on beautiful heads and necks, strong hindquarters, exceptionally good gaits – especially the walk and trot, and excellent leg conformation. Marije's sire is the permanently approved KFPS stallion Anton 343 who is currently rated #3 sire in the KFPS Breeding Index of all approved Friesian sires in the world for passing on the highest quality of gaits, conformation, and type. This is the highest rating of any KFPS approved Friesian stallion in North America. He has proven his prepotency by the fact 64% of his foals are 1st and 2nd Premie, he has 33 Ster sons, and an amazing 46% of his daughters have become Ster. Currently Anton has one approved son named Teade 392. Anton is a very talented dressage horse and has successfully competed at "ZZ" Level (Fourth Lever ) dressage in Holland. He passes on his classic Friesian characteristics blended with athleticism. His offspring are affectionate, level headed, with willing temperaments. Many of his offspring are winning in dressage, driving and saddle seat. Anton is sired by the deceased Preferent stallion Oege 267, who had a total of seven approved son and of his daughters an astonishing 58% became Ster. Anton most closely resembles his sire in conformation, type, amount of hair, and his love of movement in play. Oege was sired by the Preferent stallion Wessel 237 and out of the Ster-Preferent mare Wieske. Wessel produced six approved sons, 21 Model mares, and an astonishing 74% of his daughters became Ster. Wessel passed on good toplines, strong backs, and well muscled hindends. Anton is out of the Ster-Preferent mare, Iduna, whos sire is Tjimme 275 and her dam is the Ster-Preferent mare Penni. Tjimme was known for passing on big extensions in gaits. Tjimme is a half brother of Tamme 276, both having the same sire, Jochem 259. Actually, the two are closer relatives than that as both of their dams are linebred several times to the Preferent stallion, Ritske 202. Tamme is the sire of the newly Preferent stallion, Leffert 306. 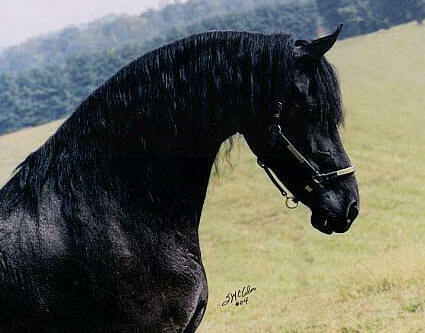 Anton is from "Stam" 50, which is by far the largest mare line of the Friesian breed. From this mare line, in addition to Anton, came 23 KFPS approved stallions, the most of any line. Marije’s dam is the KFPS studbook mare named Olda Pieternel, who was sired by Peke 268 from the Age line. Peke was sired by Bjinse 241, and out of the Star-Model-Preferent mare Stynke. 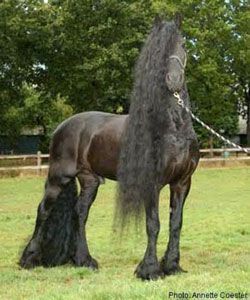 Peke was known for having the most beautiful head of all living Friesian sires. Peke reached the “Honorary Class” for driving – very few Friesians ever reached this honor. He was also a good dressage horse. Peke was known for passing on beautiful heads and necks, strong hindquarters, exceptionally good gaits – especially the walk and trot, and excellent leg conformation. His offspring have performed well in dressage and driving. Marije’s dam Olda Pieternel is out of the Star-Preferent mare Warna, whose sire was the legendary Preferent stallion Hearke 254 and she was out of the Star mare Johannie. Hearke had nine KFPS approved sons and he was known for passing on athleticism and majestic movement with suspension. Marije is from “Stam” 83, which is a mare line that stands out for fertility. The approved KFPS Friesian stallions Gerlof 294, Remmelt 323 and Olrik 383 also come from this mare line. “Stam” 83 is known for consistently transmitting quality of gaits. As you can see Marije is an exceptionally bred mare. In her pedigree, of the 14 stallions and mares in her first three generations, 8 of those are Star-Preferent including Peke’s dam who is Star-Model-Preferent. This quality thru the generations has been passed thru to all of Marije’s offspring to date.